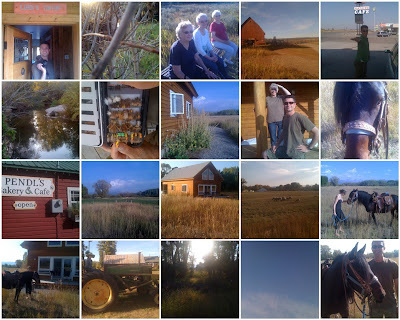 Michael's family has a cabin in the Teton Valley (the Idaho side of the Tetons). While there is cell reception in the Valley, I choose to turn off my phone. No Twitter, email, Facebook or blogs. It's a total escape. When I tell people that I'm headed to the Teton Valley - and more specifically a town called Tetonia - I am always asked, what is there to DO there? You don't have to DO anything. You can walk the 25 acres property, hike and walk in some of the neighboring town or read with the grand view of the Tetons in front of you. Nights are filled with games and fun dinners, mornings are spent greeting the sun on the porch with a book as the sun eases over the Tetons to warm the Valley. I truly think it's a getaway that is good for the soul. Sadly we go ever two years because the 14-hour drive requires at least a few days or preferably a week off. Sigh.